Weapons: All of our weapons are done! I recently went to New York to give a talk and and on the train there (and back afterward) I got the final weapon done. Fastest weapon production to date! It turned out as unorthodox and bizarre as I was hoping, and you'll love it! ONCE YOU BEAT ITS WIELDER. Enemies: There are official just FOUR enemies left to build. They're basically just the special event bosses. All of the standard issue boss types are done and now just the contextual, off-the-beaten-path boss-types are left. Environments: Nothing interesting to say here, we just simply got a couple more built out. At this point any environments we build are luxuries, as we're already sitting on 40+ environments. The remaining environments are linked to those last few remaining enemies, and then it's a few silly, for fun environments. There's also the environments needed for the arena mode, but that's a straightforward environment with subtle changes as you progress. 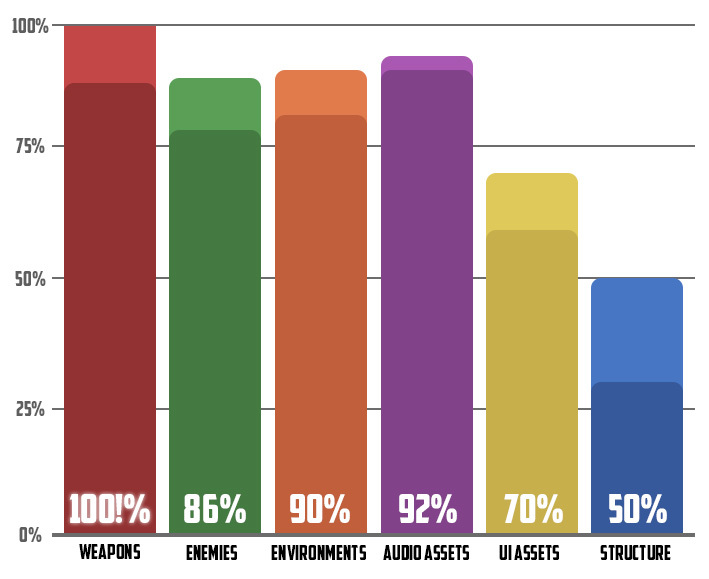 Audio Assets: I said last report that the remaining audio assets are primarily linked to enemies and weapons, so it doesn't seem like much progress but we just didn't need as many assets as I thought we would for the remaining weapon and enemies. And honestly, I've saved 5% of this bar for unknowns. UI Assets: We got a big important piece of UI slightly updated and nearly finalized! That last big chunk is linked to structure, and that's what next on the schedule asset-wise! Structure: We hit a HUGE milestone right before we broke for a little Christmas vacation. A GIGANTIC system we've been trying to nail down for a long time is finally up and running, and the last part of this Aztez mess is gluing all of the fun things we've built to it, and the last major chunk of content is for this system. This is huge for us and for Aztez! This is the goal on the horizon! There's little new tech to build, and from here on out it's Matthew putting the spit polish on our existing frameworks and me on the assembly line getting the last of these bars filled out. We're super stoked and it's amazing to think about how close we are. Stay with us a little longer, our beloved and enormously patient fans! As a huge brawler fan I’m anxiously awaiting the release of your game. Just please don’t make it steam exclusive. Even if you don’t get onto GOG, please do some sort of DRM-free release, like on Humble Store or something! Well please remember the DRM-free option in that Humble Widget!